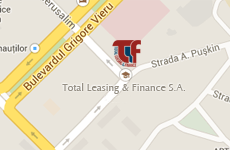 The “Total Leasing & Finance” team is at your disposal for any information. Contact us and our team will respond promptly to your request. Î.C.S. “Total Leasing & Finance” S.A. Working Hours: Monday – Friday, from 09:00 – 18:00. Lunch break 13:00 - 14:00.